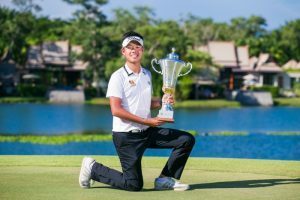 Phuket (Thailand) – May 14, 2018 (travelindex.com) – Thailand’s Varanyu Rattanaphiboonkij savoured his first professional victory in front of his family after closing with an even-par 70 to win by six shots in the final round of the Singha Laguna Phuket Open on Sunday. The 21-year-old Thai displayed great form all week as he traded two birdies against as many bogeys on Sunday to secure his wire-to-wire Asian Development Tour (ADT) victory on 18-under-par 262 total at Laguna Golf Phuket. Compatriot Pawin Ingkhapradit returned with an impressive 66, but he was unable to overhaul Varanyu’s lead. He took second-place on his own at the ฿2 million (approx. US$64,000) event co-sanctioned by the ADT and the All Thailand Golf Tour. South African Mathiam Keyser signed for a 69 to take third place, marking his best finish on the ADT this season. Nitithorn Thippong of Thailand, who started the final round in second, struggled with nerves and dropped two places after carding a 71 while Sweden’s Oscar Zetterwall (67) and Thailand’s Worrasorn Suwanpanang (68) share fifth place on 272 at the Tour’s eighth leg of the season. Playing in the final group for the first time in his professional career, Varanyu was surprised by his father and sister who flew down from his hometown of Phetchaburi, Thailand, to watch him play. “It feels like a dream! I have worked so hard all year and to finally get a win and in Thailand is amazing. My mother has been following me all four days and I didn’t know my father was going to come. It makes me so happy that they got to see my first win,” said Varanyu who also had his brother on his bag this week. Varanyu dropped a shot on the first hole but would soon recover with a birdie on hole three. He maintained a steady momentum with nine pars, before dropping another shot on hole 13 due to an errant drive. He would finish out his last five holes with a birdie on 14 when he made an up-and-down from 15 yards followed by four more pars. “After I made bogey on hole one, my brother just told me to stay calm and not speed up my tempo. I was nervous but having my whole family there to support me helped. He would distract me from the scores and I just stuck to the game plan of playing like I did the past three days,” added Varanyu. Sticking to his tee-to-fairway-to-green game plan, Pawin fired four birdies in a bogey-free round to match his low round one score. “The highlight of today’s’ round would have to be hole 16 when I missed the green to the left and chipped-in for birdie from 15-yards. I hit everything well today and my tempo was good. I am pretty happy with my second-place finish especially since I played all four rounds under par this week. I felt like I was really focused on my game plan and not thinking about other people today.” said the 26-year-old Pawin. After this win, Varanyu took up membership on the ADT and is currently 10th on the merit rankings. He took home a winner’s prize purse of US$9,450 and six Official World Golf Ranking points while the top-six players and ties earned points on a sliding scale. Laguna Golf Phuket is an 18-hole, par 71 golf course situated in the heart of Asia’s first integrated resort – Laguna Phuket, conveniently accessible by complimentary shuttle service from the surrounding hotels. Thoroughly redesigned and reopened in 2015, the new landscaping with great emphasis on natural surroundings and wildlife provides golfers a whole new golfing experience. During the game, a tranquil journey into the native cultural experience with infused local elements creates a unique sense of place. The Thai villa design clubhouse offers a host of luxury facilities, including a well-stocked Pro Shop and international dining option. The course also features Southeast Asia’s first PGA-branded golf academy, offering a holistic learning experience by PGA instructors with a wide range of teaching packages, and extensive practice facilities including dedicated swing rooms with Trackman video analysis, as well as a purpose-built fitness studio with private sessions designed to improve your performance on the course.